claimed to occupy Peter's seat. Editor's Note: This article extends the discussion of "This Disastrous Papacy" and "In Response to This Disastrous Papacy." I hope readers find it thought provoking. Since the great St. Vincent Ferrar incorrectly recognized an antipope as a legitimate one, arguably it is forgivable if SSPX folk & others, for a time, make a comparable error in our own era. Nonetheless according not to any ‘authority’ of Ann Barnhardt, but rather to the overwhelming & indeed QED evidence – in particular Benedict XVI’s own words on the matter – it remains that recognizing Jorge Bergoglio as other than an antipope is an error, & a manifest one. For contrary to assertions against that evidence, Pope Benedict did not ‘properly, licitly’ resign or abandon the papacy, but has instead publicly asserted he sought only to resign an aspect of it, while maintaining the Papal office itself. Since – unless one holds there can be two or ten or even millions of living & reigning Pontiffs – he was not in fact free to bifurcate the Papacy, his abdication was thus invalid ‘by the law itself’ due to this ‘substantial error’ - though one hardly needs Canon Law to establish that if a Pope doesn’t fully resign his office, he doesn’t resign at all. He accordingly, however inactive, remains the sole reigning Pontiff of the Catholic Faith, & Her Church. Necessarily Jorge Bergoglio was thus not ‘properly, licitly and with all due process elected to the Papacy as Christ's Vicar on Earth,’ but is instead but another – according to the Encyclopedia Britannica there have been 37 notable ones – destructive antipope. The obvious should nonetheless first be stated clearly, that the public testimony of His Holiness’s close friend & personal secretary (still, & since before Cardinal Ratzinger was elected to the Papacy), & at no less a venue than the Gregorian, is itself conclusive. Despite the risible pretense we are obliged to ignore & dismiss that testimony & thus hold Archbishop Ganswein invented it whole cloth sans the obvious acquiescence from his friend, we are also expected not to notice – a full year now – Benedict’s failure to repudiate either the testimony or its theses. Not sure if we also have to believe this failure is due to Ratzinger being hidden in Veronica Lueken’s basement, but short of that, the Bergoglioisti are in a quandary: for His Holiness is acutely aware of the philosophical principle that silence implies consent. But we didn’t need Ganswein to tell us this, because Pope Benedict had already made it clear in the announcement of 11 February 2013 & in his last General Audience – so far - on 27 February that year. Either that, though devoid of any canonical, theological, or historical foundation, not to say its potential multiplicity of popes (for if one pope is free to bifurcate, so too would the bifurcated be, ad infinitum) – or there’s a disqualifying substantial error here, by the law of the Faith itself. At any rate, the ‘clear, direct, hard evidence that Benedict did not resign,’& manifestly sought ‘to launch a novel, two Pope Papacy,’ is there for any with eyes to see, or rather for any indisposed to self-indulgent casuistry. The ‘endless speculation, gossip and tale bearing’ is not the province of those who won’t praise Jorge’s counterfeit threads. And Benedict’s declaration that the ministerium but not the munus was vacant has no more validity than the possibility of fifty reigning popes, nor of Benedict’s confused & failed abdication. Just in passing, people apparently have thought they’ve confected a Sacrament & live for years convinced they’re married, only eventually to discover with a nullity declaration that despite the children they were wrong, were confused, didn’t understand all the implications: & if folks can misconstrue something as deep & intimate & sacred as a Sacrament, surely that applies, as here it clearly does, to something as comparatively minor as a papal abdication. The evidence Benedict ‘did not abandon the Petrine ministry,’ & intended a diarchy is more than sufficient for moral certitude. So is the evidence that there can only be one living Pontiff, not more. And so, not least, is the evidence conspicuously revealing that Jorge Bergoglio but an antipope, & Benedict XVI, however inactive, remains the sole reigning Pontiff of the Catholic Faith, & the Church Christ bequeathed. Richard Cowden Guido is the author of John-Paul II & the Battle for Vatican II, & editor of the Prison Letters of Joan Andrews. "Pope Benedict did not ‘properly, licitly’ resign or abandon the papacy, but has instead publicly asserted he sought only to resign an aspect of it, while maintaining the Papal office itself." I am shocked. I know that I am a semi-illiterate; but somehow I missed Benedict's public assertion that he "he sought only to resign an aspect of it, while maintaining the Papal office itself." When did this momentous, public, assertion by Benedict happen? Please fell free to post or delete this missive as you think best. Thank you. I added a little bio at the end of the article. Thanks for drawing attention to it. As the Holy Scripture says.....”As you sow, so shall you reap.” So, we Catholics ‘reap,’ very justly, for we are all guilty, some less, but some greatly. If we take the ax to the root.......Karol Wojtyła (John Paul II), Joseph Ratzinger (Benedict XVI)......gave us Pope Francis, accordingly to their whims and designs for the ‘modern church’.....for the love of ‘men.’ Pope Francis is most obedient pupil of his predecessors. God Knows!.....this is all that matters. We have too many self-made theologians, who only confuse many Catholic hearts.....not for their good. If you read the full article, you'll find a clear answer to your question there. That most auspicious occult date was coming up! Francis is pope 13-3-13. If Joseph Ratzinger had not stepped aside willingly he would be another JP1. 13-3-13. Research it. Probably the greatest date in the whole history of that "Great Work" for which Giovanni Montini praised the wonderful last hope for mankind - The United Nations. The Great War and The Great Work are the same thing - The elimination of the Catholic Church. We are the ones who have been helping these enemies of all souls all the way, especially since 1965 and we will pay terribly for it when we come before Almighty God. We have no excuses now. Run them out. "If you read the full article, you'll find a clear answer to your question there." Hard as it may be to believe I actually read the entire article - twice. Within said article I could not find any citation, quote or even inference that Benedict, himself, has made any claim, either verbally or in writing, that he had not fully resigned the Petrine Office; or that he had somehow retained all or in part a portion of the Papal authority; or that he now shared said authority with Francis. This is an incredibly important matter. If we are to believe that Francis is not the Pope, or that he is half a Pope or even an anti-pope; and that Benedict is the true Pope, or half-pope or co-pope, we need something more to go on than hearsay, gossip and speculation. Kindly do with my missive as you see fit. Thank you for your blog. "Here, allow me to go back once again to 19 April 2005. The real gravity of the decision was also due to the fact that from that moment on I was engaged always and forever by the Lord. Always – anyone who accepts the Petrine ministry no longer has any privacy. He belongs always and completely to everyone, to the whole Church. In a manner of speaking, the private dimension of his life is completely eliminated. I was able to experience, and I experience it even now, that one receives one’s life precisely when one gives it away. Earlier I said that many people who love the Lord also love the Successor of Saint Peter and feel great affection for him; that the Pope truly has brothers and sisters, sons and daughters, throughout the world, and that he feels secure in the embrace of your communion; because he no longer belongs to himself, he belongs to all and all belong to him. "The 'always' is also a 'for ever' – there can no longer be a return to the private sphere. My decision to resign the active exercise of the ministry does not revoke this. I do not return to private life, to a life of travel, meetings, receptions, conferences, and so on. I am not abandoning the cross, but remaining in a new way at the side of the crucified Lord. I no longer bear the power of office for the governance of the Church, but in the service of prayer I remain, so to speak, in the enclosure of Saint Peter. Saint Benedict, whose name I bear as Pope, will be a great example for me in this. He showed us the way for a life which, whether active or passive, is completely given over to the work of God." The pope said he resigned the "active ministry." This certainly implies, as Richard Cowden Guido says, that he did not resign the contemplative "munus." At best his abdication was confusing and his continued wearing of the papal white adds to that confusion. He also in that addressed praised his secretary Ganswein who later made the statements about Benedict's continued participation in the papacy in a contemplative role. I think it's a little unfair to label the article "hearsay, gossip, and speculation." Right you are Mary Ann, it is just a tad unfair to label the article 'hearsay, gossip, and speculation.' Benedict did say these things of which Ganswein reiterated what he said not with the exact same words but in the true meaning of what he said and what he meant by them. OnePeterFive had an article a few years back on Ganswein's 'explanation of Benedict's 'abdication'. As to Ann Barnhardt, she has a few indications of Benedict's illicit abdication besides this, when she points out that he still dresses in Papal garb because, according to him, he couldn't find any black cassocks in Rome that would fit him. LOL.....what? Right! I guess if he couldn't find one to fit, he couldn't find anyone to make him one to fit either, in ALL OF ROME. With all the clerics in Rome, I guess there is not a tailor around that could whip one up for him. Benedict himself has given us so very many hints that this was NOT a licit abdication, they are hard to count. When we see him, he still flaunts his Papal white in full, and to see Francis and Benedict together is an 'in your face' hypocrisy to the fullest. Then there are some of the 'interviews' of Benedict where he uses language that has never been his normal 'speak'. So 'off' of how he normally expresses himself that it's quite obvious the 'conversation' didn't really come from him. Long and short of it is, that we might not know for quite some time what is REALLY happening in the Vatican with Benedict, but what I think we can 'surmise' is that whatever it is, is EVIL to the max. "The pope said he resigned the "active ministry." This certainly implies, as Richard Cowden Guido says, that he did not resign the contemplative "munus."." I take it by "munus" you mean office. The sentence in question reads: "My decision to resign the active exercise of the ministry does not revoke this." Provided that this sentence has been translated correctly into English it does not state, indicate, infer or hint that Benedict has claimed that he is still Pope, or half-pope or co-pope. Nor does it infer that Benedict has divided the papal office into two halves; namely active and contemplative; and that he, Benedict, occupies the contemplative half of the Petrine Ministry while Francis occupies the active part of said ministry. Kindly remember that Benedict (unlike Francis) was and is a theologian of note known for his precision in arguments and doctrine. You also posted in part: "At best his abdication was confusing and his continued wearing of the papal white adds to that confusion." His formal abdication declaration (found on You tube) made before the assembled Cardinals was clear, precise and complete. Everything else might be confusing; but he abdicated in a transparent manner. And in part: "He also in that addressed praised his secretary Ganswein who later made the statements about Benedict's continued participation in the papacy in a contemplative role." The Archbishop (who cannot speak for Benedict on such a matter) in his address did not claim that Benedict is still Pope, half-pope or co-pope. I pray daily for the Pope and therefore also participate in the papacy in a contemplative manner. But said prayer does not make me Pope, half-pope or co-pope. And in part: "I think it's a little unfair to label the article "hearsay, gossip, and speculation."." I did not so label. Addressing Barnhardt et al I wrote: "If we are to believe that Francis is not the Pope, or that he is half a Pope or even an anti-pope; and that Benedict is the true Pope, or half-pope or co-pope, we need something more to go on than hearsay, gossip and speculation." Until Benedict, the very precise, world-class theologian, gives us a clear and complete statement to the contrary then all we have to work with is hearsay, gossip, and speculation; which may take away from our real work which is to become Saints. And Saints are what the Church needs right now. Alas assertions, cling as folk will to them, are not evidence. Not mere assertion, and granting His Holiness's precision as you note, the visible evidence is: that by carefully maintaining he was not abandoning the munus - office - of the Papacy, Pope Benedict clearly did not just infer his intention to continue the Petrine ministry: he forthrightly asserts such. 'Forever' in fact, as he also does his intention to establish a Papal diarchy - subsequently confirmed, if such were necessary, by his close confidantes Messori & Ganswein, not to say by the careful study from Canon Law Professor Stefano Violi from the Faculty of Theology at Bologna and Lugano. Thus in opposition to assertions against the evidence, no less 'clear, precise, and complete' was Benedict's hope both to abdicate the active aspect of the Papacy even as he continued to hold its Office. Further of course, as to arguing Archbishop Ganswein in his Gregorian address 'did not claim that Benedict is still Pope...or co-Pope,' don't see how that could more openly be contradicted: for since Ganswein conspicuously declared in that discourse that Pope Benedict has 'not abandoned the Petrine ministry,' seems fair to propose this means Benedict has not abandoned the Petrine ministry - and thus remains either one of a potential multiplicity of living popes; or, however inactive, the sole reigning Pontiff of the Catholic Church. Finally, for those unenamored by the self-indulgent casuistry Mr. Guido derides, His Holiness's - precise - refusal to contradict the established philosophical principle that silence equals consent renders Archbishop Ganswein's public testimony not just vindicated, but conclusive. QED. God bless you too Mr. Comerford, and may St. Vincent Ferrar intercede to win for us that Grace of holiness we indeed need, & for which we were made.
" that by carefully maintaining he was not abandoning the munus - office - of the Papacy, Pope Benedict clearly did not just infer his intention to continue the Petrine ministry: he forthrightly asserts such." Please. Benedict formally and properly renounced the Petrine Ministry before the assembled Cardinals and the world's media. See YouTube. And in part: "Benedict's hope both to abdicate the active aspect of the Papacy even as he continued to hold its Office." As evidenced by the record Benedict has, to date, made no such claim. Ms. Barnhardt et al do not speak for Benedict. And in part: "Benedict's hope both to abdicate the active aspect of the Papacy even as he continued to hold its Office". Please. Again. Benedict has made no such claim. And in part: "the established philosophical principle that silence equals consent renders Archbishop Ganswein's public testimony not just vindicated, but conclusive." Yet again. Please. It is not a theological principal. Christ did not tell us to spread His Good News by remaining silent. Look. You and I have to strive to be Saints. Right Now. That is exactly what the Church needs. Ms. Barnhardt et al may openly hold that Francis is an anti-pope and Benedict is the true Pope. But there is no evidence to support Ms. Barnhardt;s claim. What exists is only a single address by a single Archbishop wherein he makes vague comments that (at least in the English version) can be interpreted and spun in a number of directions. To RW Comerford and other who dispute the fact that Pope Benedict XV1 is still pope. Pope Benedict was lawfully elected. There are very credible doubts about the catholicity of cardinal Bergoglio in the light of his many heterodox statements and the attempt in Amoris Laetitiae to undermine marriage, confession and the eucharist in its Chapter 8. Such attempts would probably render any normal catholic subject to excommunication. In my view there are several heretical and schismatic cardinals active now in the college of cardinals. What does all of the mean for an ordinary catholic? It means that Pope Benedict XV1 [despite his assertions that he abdicated] is the only SAFE OPTION to pick as the sole valid and legitimate pope. Pope Benedict may sincerely have thought he could divest himself of aspects of the papacy but in my view he is theologically incorrect. This partial resignation act of his has caused untold confusion and distress. How the mess is to be resolved is a matter for the bishops and the cardinals. Not a good situation and prayer is required to help all affected.. Round & round, but it remains that assertions do not constitute evidence. And remains so despite insistence from some that we focus only on the holograph while ignoring the visible evidence Mr. Guido detailed so well for anyone not determined to hide from it. That evidence, very particularly Benedict's own words & claims (not Barnhardt's), manifestly demonstrates that Benedict sought solely to renounce the active aspect of the Papacy, but not the Office itself - and accordingly remains the sole reigning Pontiff of the Catholic Church. Meanwhile unquestionably true t'is our prime obligation to love God above all else & thereby to become saints; but seems fair to adduce opposing the depredations of an antipope hardly contradicts that aspiration. "This partial resignation act of his has caused untold confusion and distress." From Benedict's public resignation made in public in front of the assembled Cardinals and media. "For this reason, and well aware of the seriousness of this act, with full freedom I declare that I renounce the ministry of Bishop of Rome, Successor of Saint Peter, entrusted to me by the Cardinals on 19 April 2005, in such a way, that as from 28 February 2013, at 20:00 hours, the See of Rome, the See of Saint Peter, will be vacant and a Conclave to elect the new Supreme Pontiff will have to be convoked by those whose competence it is." Benedict did not make a partial resignation. He does not remain Pope, half-pope or co-pope. I have read that there are 80,000 Christian Churches in North America. Ms. Barnhardt et al are in effect making yet another one by declaring Francis an anti-pope (and Benedict Pope) and thus creating another splinter (Schism) within the Mystical Body of Christ. The first Pope denied Christ three times. Popes are not immaculately conceived. And even if a Pope leads life of heroic virtue (a Saintly life) he can still make very wrong decisions when not protected from teaching error by the Holy Ghost. The schism is being caused by cardinal Bergoglio aka "pope" francis publicly written that he is prepared to give bishops doctrinal authority in their own dioceses. That is a recipe for schism and disunity. In addition several catholic churches now operate different guidelines on communion for divorced and remarried as a consequence of cardinal Bergoglios publication Amoris Laetitia. That is de facto schism and it is being caused and driven by cardinal Bergoglio who has waged war on conservative catholics from day one of the most probably invalid papal conclave of 2013. I suggest you be be very careful about following or listening to a man like cardinal Bergoglio who repudiates Christs teaching on marriage and divorce and pours scorn on the 10 commandments. A Mr. Antigon posted a reply directed to me. As always please fell free to do with my missive as you see fit. Mr. Antigon posted in part: "Round & round, but it remains that assertions do not constitute evidence." Evidence that Benedict is no longer Pope: "For this reason, and well aware of the seriousness of this act, with full freedom I declare that I renounce the ministry of Bishop of Rome, Successor of Saint Peter, entrusted to me by the Cardinals on 19 April 2005, in such a way, that as from 28 February 2013, at 20:00 hours, the See of Rome, the See of Saint Peter, will be vacant and a Conclave to elect the new Supreme Pontiff will have to be convoked by those whose competence it is." And in part: "we focus only on the holograph while ignoring the visible evidence Mr. Guido detailed so well for anyone not determined to hide from it"
There is no evidence, visible or otherwise, that Benedict did not renounce the Petrine Ministry in a most public, transparent and complete manner. And in part: "That evidence, very particularly Benedict's own words & claims (not Barnhardt's) manifestly demonstrates that Benedict sought solely to renounce the active aspect of the Papacy, but not the Office itself"
And where or where is this evidence that counteracts Benedict's actual and public words: " the See of Rome, the See of Saint Peter, will be vacant"? And in part: " fair to adduce opposing the depredations of an antipope"
Declaring Francis to be an anti-pope is, objectively speaking, an act of schism. Again, objectively speaking, a mortal sin. Barnhardt et al (like Luther and Calvin and countless others) have in effect created yet another splinter separate from the Body of Christ. Apparently this splinter is a very popular one in some circles. But we do not want to be one of the cool kids on Judgment Day. Any catholic is entitled to hold doubts concerning the validity or otherwise of any papal election. There were once 3 men claiming to be pope during the Great Western Schism. But you it seems you are now declaring any catholic who doubts the current strange twin papacy to be schismatics and also mortal sinners! It is not your prerogative or right to declare anybody a mortal sinner much less to decide on who is or is not a member of the Mystical Body of Christ. One would need to be completely blind not to realise that truly serious problems have existed in the roman catholic papacy over the past four years. Four senior cardinals have serious doubts about Amoris Laetitiae, different bishops now apply different standards. One of the marks of the true catholic church is that it is indeed one church . That unity is splinting in Germany,Malta and Argentine where remarried divorcees are allowed receive the Eucharist. Therefore unity of belief and doctrine as heretofore understood is breaking down in the catholic world. This is the work of cardinal Bergoglio aka "pope" Francis. Mr. Anonymous wrote in part: "Any catholic is entitled to hold doubts concerning the validity or otherwise of any papal election." Doubts!!! Ms.Barnhardt et all have publicly declared Francis to be an anti-pope and Benedict the true Pope. No doubts there. and in part: "There were once 3 men claiming to be pope during the Great Western Schism." And the Great Schism ( 1378 to 1417.) so weakened the Church that it paved the way for the Protestant Revolt. And in part:" It is not your prerogative or right to declare anybody a mortal sinner much less to decide on who is or is not a member of the Mystical Body of Christ." Kindly tell me who I named as a " mortal sinner" and also who I named as "not a member of the Mystical Body of Christ.".? and in part: "One would need to be completely blind not to realise that truly serious problems have existed in the roman catholic papacy over the past four years." Oh please. When has the Papacy NOT had "serious problems"? and in part: "Four senior cardinals have serious doubts about Amoris Laetitiae, different bishops now apply different standards. One of the marks of the true catholic church is that it is indeed one church ." I imagine that it is a lot more than four Cardinals who have doubts. And the four marks are: one, holy, catholic and apostolic; and right now the only folks who have formally and publicly broken with that oneness are Ms. Barnhardt et al. and in part: "That unity is splinting in Germany,Malta and Argentine where remarried divorcees are allowed receive the Eucharist. Again. Please! Divorced and remarried Catholics have been publicly receiving Holy Communion now for over half a century. Often from the hands of Bishops and Cardinals. and in part: "Therefore unity of belief and doctrine as heretofore understood is breaking down in the catholic world." No. You are quite wrong. Belief has already changed among many if not most Catholics for over 50-years. Nothing new. and in part: "This is the work of cardinal Bergoglio aka "pope" Francis." Now you are being silly. It is the work of Satan. Not one man. And we are all, you and I included, responsible because of our sins. From a worldly perspective the Faith has been destroyed. But the Holy Ghost will prevail as He always does. In the meantime instead of having hissy fits and throwing our toys out of the pram we have to instead strive to be Saints. It is much easier, and much cooler, to loudly proclaim Francis the anti-pope rather than undertake the hard work to reform our own lives. Be a Saint. Do not be one of the cool kids. Catholic belief can not change from that which was deposited as the faith from our Lord Jesus to the first apostles who then passed it on down through the church. You assert there is no faith and on that you are wrong. There are people who try live catholic lives. Cardinal Bergoglio aka "pope "Francis seeks deliberately and covertly to undermine true catholic doctrine that has been clearly taught over the last nearly 2000 years. I suggest you study what the man has been saying and doing since the invalid papal conclave of 2013. He has also denied publicly the immortality of the human soul which is in essence a denial of the bodily resurrection which is a DE FIDE catholic church teaching. Cardinal Bergoglio is not a catholic in any true meaning of that word. You were told about the Western Schism where legitimate cardinals elected not one but two popes. The catholic church is now in a similar mode where cardinals in a rush have elected an anti pope in the mistaken belief that the existing pope resigned properly and in accordance with canon law. Pope Benedict XV1 has not resigned in accordance with the legal norms required for a valid resignation one of which states all such resignations must be PROPERLY MANIFESTED. Pope Benedict retains all the trappings of the papacy and his spokesperson Ganswein stated that he still held on to the office in a contemplative manner. If it looks like a duck etc etc then it is a duck. It is very much a spiritual horror show and many catholics go with the flow in thinking that Bergoglio is in fact a pope. Mr. Anonymous wrote in part: "you assert there is no faith and on that you are wrong. No. I certainly did not. And in part: "Cardinal Bergoglio aka "pope "Francis seeks deliberately and covertly to undermine true catholic doctrine that has been clearly taught over the last nearly 2000 years." and in part: "what the man has been saying and doing since the invalid papal conclave of 2013." Who has declared said conclave invalid? Barnhardt et al? That declaration certainly carries a lot of weight. and in part: "Cardinal Bergoglio is not a catholic in any true meaning of that word." and in part: "You were told about the Western Schism where legitimate cardinals elected not one but two popes." No. Not two. But 8. 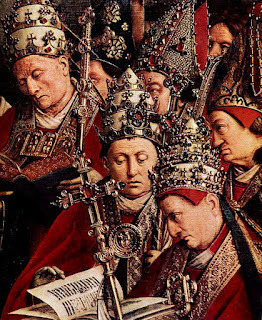 Between 1378 to 1417.
and in part: "The catholic church is now in a similar mode where cardinals in a rush"
There was no rush compared to recent conclaves. and in part: "Pope Benedict XV1 has not resigned in accordance with the legal norms required for a valid resignation one of which states all such resignations must be PROPERLY MANIFESTED." That is the weighty position of Ms. Barnhardt et. al. Cardinal Burke, among others, disagrees with the Barnhardt position. And of course Ms. Barnhardt attacked Cardinal Burke. and in part: "Pope Benedict retains all the trappings of the papacy and his spokesperson Ganswein stated that he still held on to the office in a contemplative manner." You mean the white cassock and beanie? Mighty trappings indeed! And this is what Benedict himself said: " For this reason, and well aware of the seriousness of this act, with full freedom I declare that I renounce the ministry of Bishop of Rome, Successor of Saint Peter,"
and in part: "many catholics go with the flow in thinking that Bergoglio is in fact a pope. Nothing could be further from the truth." If you are not anonymously speculating then ! have read that there are 80,000 Christian Churches in North America. I guess that makes you Barnhardt et al 80,001. Maybe you should take up a collection? Be a Saint. Not a speculator. And while it appears Mr. Guido has not as such declared Bergoglio an antipope - noting instead merely that the evidence he illustrates does - Miss Barnhardt's more forthright assertion would only be an objective act of schism and mortal sin if Bergoglio's other than the antipope that evidence reveals. In light of it, arguable t'is not Miss Barnhardt that has created any splinter; & as to a break from the one, holy, catholic & apostolic Faith, seems fair also to propose t'is pretty clearly Bergoglio who's broken from that, not Barnhardt. You will, of course, again assert that no such evidence exists, while continuing to avoid addressing the overwhelming evidence in Mr. Guido's post showing that it does. But again, assertion against reality doesn't alter that reality - nor, in passing, do unworthy lawyer shots invoking Luther & Calvin, or being cool. Again, that evidence demonstrates that Benedict XVI remains the sole Pontiff of the Catholic Church, as it does that Jorge Bergoglio is but another, if especially vicious, antipope. And while Judgment Day may cause us just terror on many grounds, noting that evidence will not be one of them. Meantime may in his day the objectively schismatic St. Vincent Ferrar intercede to help us to turn to our Lord, and thereby recover from our sins. Mr. Antigon posted in part: "While you note what you consider sufficient evidence"
It is not I who believe that there is sufficient evidence. I am a nobody. But it is the Cardinals, Archbishops and Bishops of the Roman Catholic Church. The successors to the Apostles believed and still believe that there is more than sufficient evidence when Benedict said "I renounce the ministry of Bishop of Rome, Successor of Saint Peter". Who are you, Barnhardt et al to accuse Benedict of being a liar and ALL the Successors to the Apostles to be his accomplices? And in part: "you steadily avoid addressing Mr. Guido's comprehensive & QED evidence from Benedict's own words"
No. You are being most unfair. I have repeatedly asked you where and when did Benedict claim that he is Pope, half-pope or co-pope and that Francis is not Pope, or is half-pope or co-pope. I am still waiting. And in part: "arguable t'is not Miss Barnhardt that has created any splinter"
Please. You, Ms. Barnhardt et al have, objectively speaking, made a public act of rebellion not only against the Vicar of Christ but EVERY cardinal, Archbishop and Bishop, the Successors to the Apostles, in the Roman Catholic Church. I hereby note that Ms. Barnhardt has also publicly attacked and condemned, of all people, Cardinal Burke. Is there any Church authority that she and her followers will accept? And in part: "do unworthy lawyer shots invoking Luther & Calvin"
Barnhardt et al, like Luther and Calvin, offer no evidence that Francis is not Pope and Bennedict is Pope beyond mere speculation, gossip and tale bearing. Barnhardt et al, like Luther and Calvin merely attack Francis' faults, real and imagined, as justification for their rebellion against the Vicar of Christ and the Successors to the Apostles. That is caleld Donatism. A Condemned heresy. St. Augustine spent much of his life suppressing. And in part: "that evidence demonstrates that Benedict XVI remains the sole Pontiff of the Catholic Church"
Again what evidence? Why should anyone follow an anonymous party on the Internet while ignoring the unanimous opinion of EVERY Successor to the Apostles? You are encouraging folks to risk their immortal souls in an act of rebellion. Remember who led the first great rebellion. Reflect. Do not be one of the cool kids on Judgment Day. Your sad judgementalism of catholics unhappy and troubled with the current double papacy continues. It is not necessary for salvation to accept the decision of a papal conclave if one sincerely believes that conclave has acted mistakenly or improperly. The cardinals who brought about the historical western schism I outlined to you acted improperly and mistakenly. There is precedent in catholic church history for corrupt papal conclaves and that is a fact. This point seems to escape you completely when you keep going on about how dare anybody question cardinals and bishops. It seems to me you are fearful that cardinals could make such grievious errors. You really should not be because Christ remains the head of the church . In other words the very idea that Pope Benedict may be dissembling is simply too appalling to be contemplated and must therefore be dismissed. I suggest you read Sandro Magisters excellent essay on a "Pontificate of Exception". This is Pope Benedict suspending ALL the normal rules in a case of necessity. The sovereign has the power and the right to act in such a manner. Benedict has his reasons that we do not know and all his actions speak louder than any words of resignation which in themselves are not sufficient to manifest properly any resignation. A papal resignation must be PROPERLY MANIFESTED to be valid in canon law. This has yet to occur with Pope Benedict. The roman catholic church has weathered many storms over the papacy and this one will soon be over thank God. I'm not sure much else can be said here. I'm closing the comments. How Are You Honoring the Feast of the Visitation? Am I "Filled with Anger and Hatred?" Jesus Longs to be Your Friend! Will You Respond? This Disastrous Papacy and the Big Question! Affirm a Mom Today: You May be a Lifeline! Have You Ever Met the Devil? What are these 2 silly women doing?